Yes, the puns are no joke. Yes, the title is a touch OTT. SBTB covered this issue way better than I ever could (prepare for snort laughing), so let’s just get that out of the way now. Because y’all, this book is delightful. A touch frustrating at times, but overall delightful. Piper is an aspiring vet, working herself to the bone to try to pay for school. When we meet her, she’s juggling three part time jobs and doing none of them well. Her passion is animals, however, and she spends as much time as she can at a local shelter, volunteering. Aiden is a billionaire CEO who doesn’t read like one; a genuinely compassionate guy who doesn’t really know how to be vulnerable, but decides to try his best with Piper. Their meet-cute is two-fold; the first bit is through one of her rando jobs and the second is because he just adopted a dog from her shelter. He’s in need of a dog walker (all those long hours being a billionaire, after all) and decides Piper is his gal. Some convincing takes place, but finally she acquiesces and our plot is off like a shot. However, while they’re busy falling for each other (duh, y’all), someone is out to destroy the shelter! Threats of violence turn into actual violence and provide a backdrop of minor suspense to accompany this happily ever after. This is Griffin’s debut novel and I am excited to see where we go from here. The dialogue is witty, the characters vibrant, and my only trifle was with some of the constructed conflicts which just weren’t my cup of tea. However, I have marked the second book in the series as to one to read, and greatly look forward to more from this author. I read this with a fizzy Diet Coke with a few slices of lemon on a warm day by the pool. Perfect location and beverage for this read. Would like to support good, humane breeders? Looking for that special breed? Check out the Humane Society’s guide to finding ethical breeders. One of Piper’s jobs is as a singing telegram! Sound like something you want to hire? Check out this link. I received a copy of this book from NetGalley in exchange for a fair and honest review. Thanks publishers! 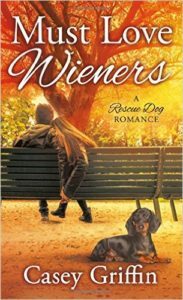 Animals, Contemporary, Diet Coke, Romance, Series, Small Town, U.S. The title is hilarious! Very OTT. Great review.